Category Archives: 2. Know the content and how to teach it. Engagement is the Key. Making school fun. It’s wonderful and exciting how separate actions can lead to one destination. 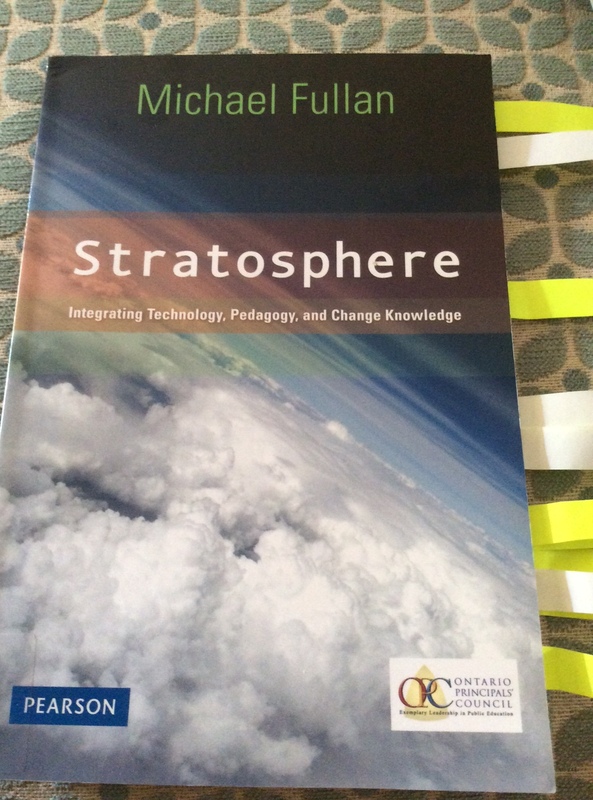 I have been reading Stratosphere by Michael Fullan in preparation for my new role this year as an ICT integrator and I am finding lots to think about as you can see by my yellow sticky notes popping out. At the beginning, Michael states four criteria for integrating technology and pedagogy. I’m really engaged by problem based learning and found Lee Crockett’s Solution Fluency a great way to structure a unit of work incorporating technology and literacy. I believe this unit covered three of the four criteria. The initial scenario is outlined below. The students understood this was a hypothetical situation but in reality it gave them a great vehicle for finding out what was great about our school and celebrating it with their peers and parents. They were incredibly engaged and came up with great promotional videos after weeks of organising, structuring ,capturing the right shots and interviewing. I was uplifted by their efforts and believe that the Solution Fluency backbone made it successful. I was reminded of this project when reading this Integrating Education Technology post by Michael Boykin this morning and the statement that technology could be used by students to ‘show what they know’ which is one of my favourite mantras for Ed Tech. Oh and as I have taken up the #bloggermore2015 challenge I have also tried to improve my blog post by adding some power words in the hope that it will improve my writing after reading Jon Morrow’s post. See more here. Another global classroom success organised through the power of Twitter and connected through the simplicity of Edmodo! It has been our privilege to connect this term grade one and two students from Dalkeith Primary School in Perth and Windsor Primary School in Arlington Heights, Chicago. As our American friends school year draws to a close, I thought I would share a snapshot from an activity we did and wish them a fabulous summer break. The students and I have learned so much about life at both schools. We have enjoyed learning through shared mini movies, pdf’s and comments made by the children and teachers at both schools. We have also shared pictures and movies about life at our school. 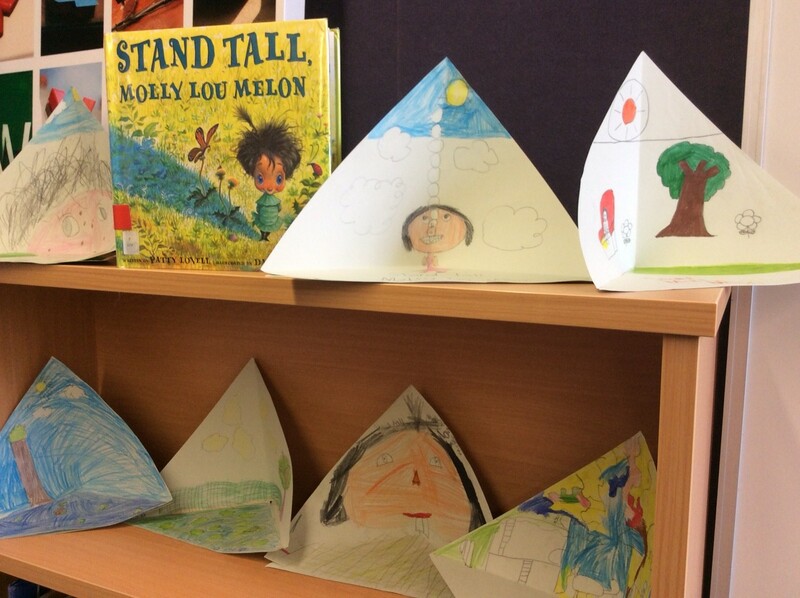 Today we read Stand Tall, Molly Lou Mellon by Patty Lovell and David Catrow. We chose this story because it is an American book. Molly Lou Melon is also an awesome character and her story is one that everyone should read. Windsor School are reading books by Australian author, Mem Fox. We know how fabulous those stories are because we have them in our library at school. Reading aloud to students. Sharing my choices. I get to spend about 30-40 minutes in the library with the students from Pre Primary to Year 7. In this time I promote books, help students to select books, issue and return books but my absolute favourite part of the time we spend together is when I get to read out loud to them. The PP’s and Year 1’s get read picture books and I will show some of my favourites another time as I wanted to share the books I’m reading to the other grades. Year 2 The Magic Finger by Roald Dahl. 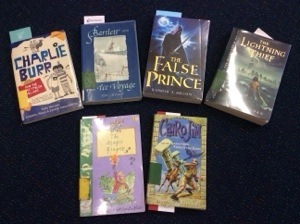 I haven’t read a novel to Year 2 before as I wasn’t sure they would be able to hold onto the plot over a week but emboldened by last year’s success of “The One and Only Ivan” by Katharine Applegate (which I read to the Year 3’s during ICT/library) I decided to give it a go. They loved “The Magic Finger” and when we finished it this afternoon they requested “Charlie and the Chocolate Factory”. Great Australian novel and perfect for this age group. Fun to read out loud and a little bit naughty. I’m hoping this will lead to the other books in the series being requested. Year 4 Bartlett and the Ice Voyage by Odo Hirsch. An oldie but a goodie, full of rich vocabulary. This starts off a but slowly but with good voice acting is an interesting read. I was really looking forward to this but as a read out loud it is not as successful as I’d like. I find the conversation a bit clumsy, however, the students are still happy to listen. One student couldn’t wait to find out and bought the books. This absolute gem was brought to my attention by my Teacher Librarian friends on Twitter. I’m really enjoying this read as the dialogue reads well and the characters are nicely drawn by the author. One student has held off from reading the sequel. Seeing him intently listening is a great reward. I wonder how many other Teacher Librarians get to read novels to their students? Reading to a child is such a joy and provides many learning opportunities that add to their literacy. During my planning phase for semester two, I came across the Global Education website. This great website has units that focus on global issues and links them to the Australian Curriculum. I found a unit called Peace Building which suited my age level and was a topic I’m passionate about. However, I wanted to connect my students with other students so I began a looking on the web to find a project that we could join that would facilitate this. I found the Peace Crane Project and Pinwheels for Peace. The Peace Crane Project asks that you create an origami crane using a piece of paper that has a peace poem written on one side and a peace illustration on the other. 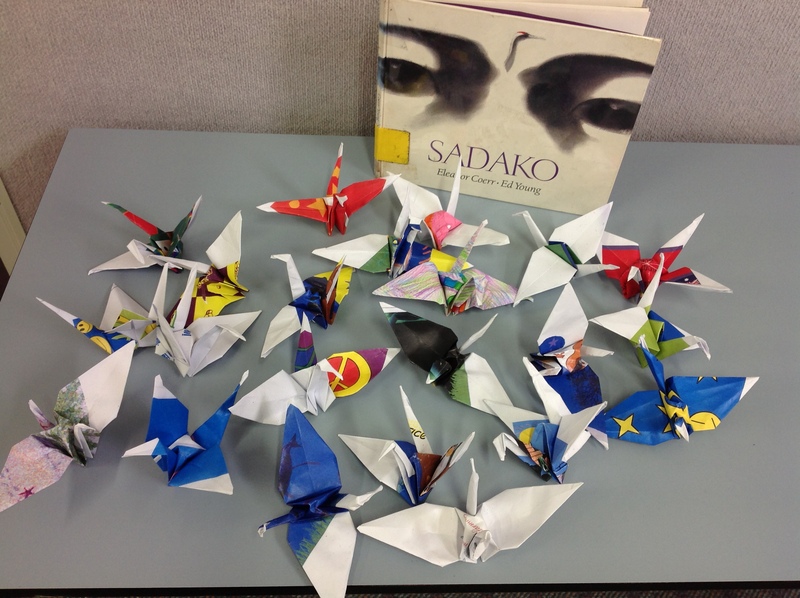 These cranes are then displayed on International Peace Day or you can exchange them with another school. I clicked on the exchange button and was contacted by a teacher in Smolenskoye, Siberia. This was very exciting and I was able to email my exchange partner and we agreed to try and continue the exchange through snail mail and through Skype. The tyranny of longitudinal distance can play havoc with Western Australian schools as we are often too early or too late to Skype but Siberia is only a few hours difference. I also Tweeted this information on Twitter and Karen Stadler contacted me and said that her school had also joined this project. I also happen to notice as I was scrolling through the Peace Crane Exchange partners that another Twitter colleague, Melvina Kurashige had also joined. I sent a tweet to Karen and Melvina highlighting this fact and after a tweet storm between us a blog was created where all three schools could share their Peace Crane work. Please take time to visit and add your message for peace on the wall and see our work in progress. You can find us here. Since it’s creation on August 28th, we have had two other schools join us! Once again I am in awe of the power of Twitter and global projects to connect educators and lead to real opportunities for our students. I am so excited to be part of this community and with International Peace Day just around the corner, I hope that you too will reach out the hand of friendship. Having a go at global projects. It is amazing how a small leap of faith can result in opportunities that were inconceivable before.My Year 4 ICT class is doing a unit on peace and I recently joined the Peace Crane Project to provide the students with an opportunity to celebrate International Peace Day on September 21st. When signing up to the project it asked if you wanted to be part of a classroom exchange. I ticked the box as I’m always happy to make connections. Within 24 hours I had received an email from a teacher in Siberia, asking if we wanted to exchange with them. When I replied that we would love to (Siberia! How exciting!) she asked whether we would be open to extra exchanges like swapping drawings, having a Skype session (we are only 2 and a half hours apart time wise) and generally learn about each other’s environments. What a thrill! Isn’t this what peace is about? To learn and understand each other. These children will never see the world the same again. The students are learning about biomes with their classroom teacher and when I showed them where the school was they were able to identify that the region was tundra. I am so excited to be part of this experience and it all started by looking for a way to participate in a global project. If you want to try a global project, you can go to The Global Classroom Project 2013-2014. This is a fabulous community to be part of with great projects. I had to write and say how thrilled and honoured I was to be nominated as a Global Classroom Lead Teacher 2012-2013. I think I fall into the category of ‘most improved’ as I haven’t run any projects myself but have been an enthusiastic participator. 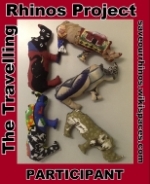 Previous posts have outlined the fabulous projects I have been lucky enough to participate in. Where I like to think I have made a bit of a difference is in the promotion area. I am talking about global classrooms and the power of Twitter to transform our classrooms whenever I can. I truly hope that if I keep talking about it and participating, more people will become involved and our children will truly become citizens of the globe. I would also like to say how nice it is to receive recognition. Teachers often work in environments where recognition doesn’t come along very often. We happily save for posterity any letters of gratitude we receive and I know I have an thank you email pinned up on my board at school. These small reminders keep us going. Below is the list of this year’s nominations. I hope you celebrate the achievements too and are inspired to join the community and participate in the next wave of projects. Global Classrooms – Join in on the fun! On the 26th June, I celebrated my first Twitter birthday. It’s hard to believe that only 12 months ago I was unaware of how significant this social media platform would be to my development as a teacher. I have written before about how Twitter has enabled me to make connections in the world and how these connections have helped not only me but the classes I have been teaching. 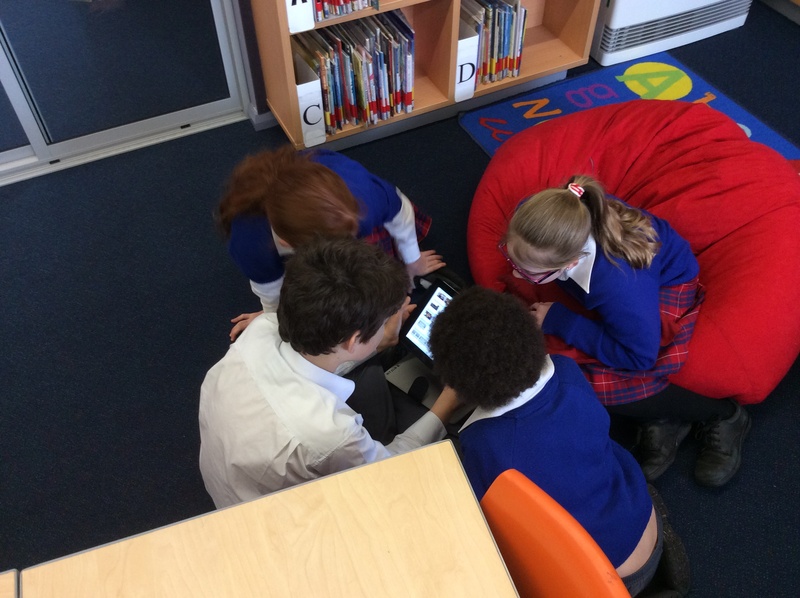 In my role as a Teacher Librarian who also teaches ICT from K-7 in a rural Western Australian school, global connections have meant that my students have been able to learn from other students in the world, reach out to people and to have an authentic audience for their work. This semester, I have been very fortunate to be involved in two very different initiatives organised by teachers in two different continents. Mrs Karen Stadler’s (@ICT_Integrator) Save Our Rhino’s project from Elkanah Primary in South Africa enabled the students to learn about endangered rhinos knowing not just that they were endanagered but how people around the world were passionate about saving them. This connection with people is what makes the global classroom aspect so powerful. It was also a great link for us to learn about our own endangered animals and hopefully educate others in the world about them. Ms Katy Gartside’s (@KatyGartside) 9-to-9 Skype Marathon run by her Year 5 Class at The School of Columbia University in the USA was brought to my attention by Katy’s twitter feed. I have Skyped with Karen last year and I love the opportunity for the student’s to have the face to face experience with kids from other classrooms, so I expressed an interest in participating. Luckily for us, we were able to connect with times, not always possible in the US due to the time differences betweeen us. We were the 8.45pm session for them and the 8.45am session for us. The Year 6 students in my class were blown away by the articulate students running the session and learnt a lot about community but more about the similarities and differences in their own schools. 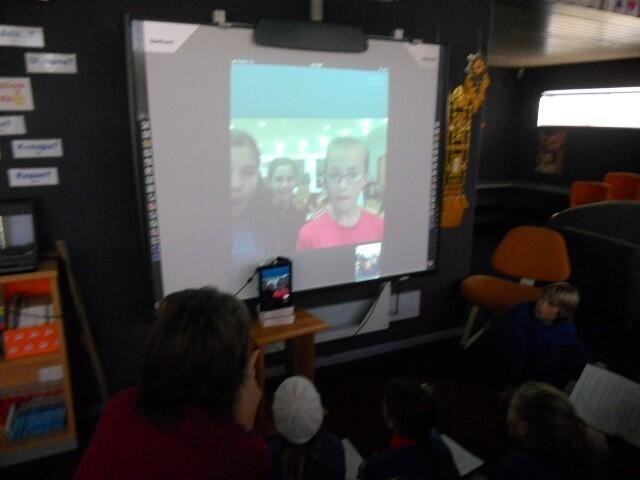 We reflected on the session and I think every child loved the Skype experience. I encourage every educator to make connections globally. Twitter has been for me the most effective way to make these connections and I have found the people to be generous, supportive and inspiring. If you would like to join Twitter I would recommend you follow the above two educators and Michael Graffin (@mgraffin) who is the #globalclassroom Project Co-founder, you won’t be disappointed. Last year, I started a Surfing history unit for the upper school and am now reteaching it to the current year 6 class. I like to add local content to my lessons wherever I can and our school is in an international surfing destination and many of the students surf. This term there was also an International Surfing Contenst run here. I find that many students are surprised to find out how recently international surfing came to our town. We are learning note-taking skills using digital, online (websites and class blog) and paper sources. We have written a biography on Duke Kahanamoku. We are also creating a timeline using Excel and soon they will be taking on an individual research project. Choices include women in surfing, surfing offshoots like kite-surfing, the dangers of surfing and the future of surfing. We created Movie Maker presentations last year but this year the class have access to 7 iPads and I am thinking about how we can use them to create the presentations. I am on a steep learning curve but am relying on the skills the students already have to teach me. The Year 6’s have a class blog which their teacher uses on a daily basis to put up reminders, notes and links to information and websites that will help the students during the week. I have also included links to my lessons and have found that if I take the time to add content the students are more prepared for my lessons. Next term the classroom teacher is considering using Edmodo as well and as this class were one of two classes I used Edmodo with last year, she need only do a basic run through and the students will be up and running with it. There are many benefits to using Edmodo including the ability to submit assignments. We are one of a few Catholic schools left in Western Australia who have Year 7’s. This year I thought I would tackle an Ancient History unit linked to the Australian Curriculum. I chose Ancient China. So far we have watched a segment of the Disney movie, Mulan and compared it to the story of Mulan and considered what features of Ancient Chinese Culture had Disney kept. We did a geography lesson and learnt about the natural barriers in Ancient China that were instrumental in developing Chinese culture. We have been learning about the various dynasties, some of the main characters and now they are involved in a Silk Road Board Game group project. It would be amazing if I had the ability to get the students to create an online game but it is beyond me at the moment. However, it is certainly something to strive for next year. Here is a slideshow of today’s lesson. Although we don’t have middle and upper primary “library lessons” here at school, our dedicated IT time is about 100 minutes which gives me plenty of time to develop the skills that would normally be classified as library lessons. Next semester I will be focussing more on literature and am hoping to explore QR codes to deepen the engagement with the books in our library. I would like to try book trailers and will probably hold another event in the library like last year.